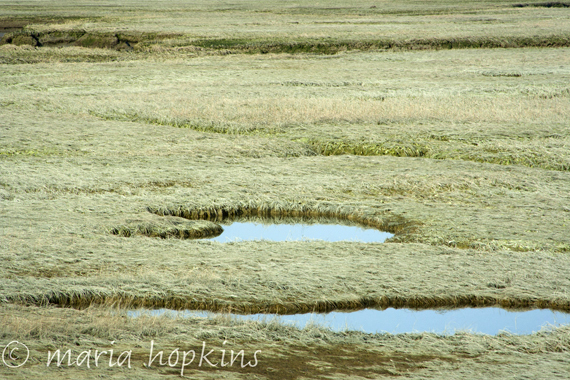 This is the kind of mood I'm in today, just like a felt when I chose this scene to photograph. I was out with a friend for the afternoon just to look for photo ops. We drove all over the beach area and stopped the car when something caught our eye. It was a great, very satisfying, fun day. 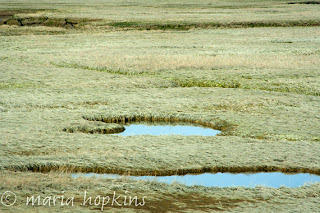 What I loved: the smooth still water against the texture of the grassy marsh and the colors, of course. It was just really nice. I was trying so hard to photograph one of the many seagulls in flight on this beautiful sunny afternoon. 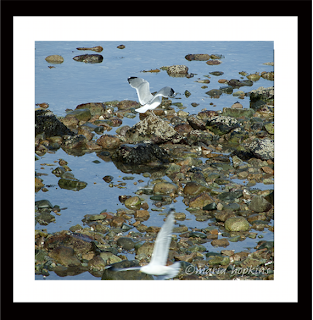 The white birds against the blue water and wet shiny rocks was too enticing. There were many seagulls, some catching some rays on the rocks, and others just flying free. It was difficult to focus in on one of them because they were so quick. I was wishing I had a stronger zoom lens, too. Somehow, I was able to focus on the seagull landing on the rock and didn't notice the other one until I imported my photos to my computer at home. It was a "Wow!" moment. Truly a moment in time.